The Geneva SEO Expert will rank your pages in Google in the shortest time possible. I have a winning SEO strategy that works in any Swiss town and produces phenomenal results. I could start optimizing your pages within a week. I have a background of ten years in SEO, and my landing pages create first-page rankings. My strategy follows the search engine guidelines (White-hat) and is 100% safe for your site. 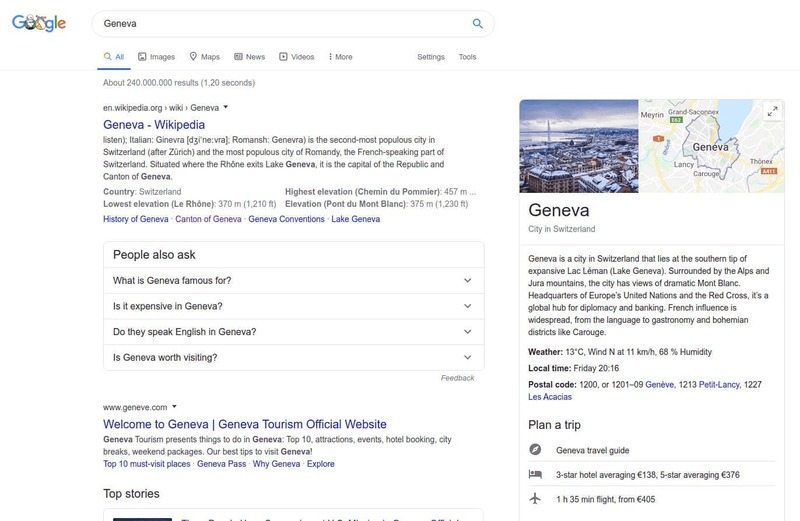 I have a unique SEO method that can rank any page in Geneva or any Swiss location. Some of my pages rank with no backlinks in specific niches, because I have used advanced SEO in their design. Any niche you can think of, my pages can make the difference. It will be hard for third-parties to beat my landing pages. I work with unexploited content opportunities (White-hat method). I generate leads from Google search, Google Maps, YouTube, etc. The search performance of my pages leaves little space for competitor growth. I will help you transfer your focus from the mundane tasks to what matters in growing your business. Usually, I offer a six-month retainer that lets you check my work and decide if it makes sense for you. Six months is the least time to produce measurable results. If you compete in a competitive niche, then I will need to work for a longer timeframe. The same applies when I am dealing with a penalized site. Ask for my quote using the form below. I will aim to position your website among the top players in your niche. I will not spend your money on useless backlink packages or Google Ads. Both tactics are vain when creating organic traffic. Those link packages generate a host of backlinks that break SEO. My work is about using low-impact tactics that deliver fast and permanent results. Google does not disclose information about its search engine updates. So most SEO consultants are clueless when an update occurs, and cannot fix things that break. Engine updates, penalties, and rankings drop hit millions of websites. My pages work along with Google and go with the algorithm wave. Thus, my pages can rank or do better after a Google update. I have already mentioned here that in some niches my pages rank with zero backlinks. It is their superior quality that facilitates those rankings. Most of the consultants have no clue how SEO works and experiment on their client sites. I spend many hours into researching and building the best landing pages in the market. You will reach your organic traffic goals when you have my landing pages. I will stop the spending on useless tactics, and I will make you confident of the SEO channel. You can expect only positive things from using my pages and strategy.